Lebanese President Michel Aoun emphasized on Wednesday the need to implement the strategy for revamping the country’s economy, prepared by consulting firm McKinsey & Company, National News Agency reported. “The strategy is very important especially that it provides a coherent and comprehensive study for all productive sectors in the country aimed at reaching sustainable economic development,” Aoun was quoted as saying during his meeting with Economy Minister Raed Khoury. The meeting, attended by McKinsey’s team, aimed at highlighting the major components of the strategy. “We appreciate all the efforts exerted by the public and private sectors in addition to economists and academics to complete this strategy,” the president said. The global management consultancy firm was hired earlier this year over a six-month agreement valued at 1.5 million U.S. dollars to form a strategy aimed at revamping Lebanon’s economy. Some Lebanese politicians criticized the government for paying such a big amount for a study, while calling for local economists to prepare the strategy. However, then Prime Minister Saad Hariri issued a notice in February to all public administrations, public institutions, councils and municipalities, calling for cooperation and coordination with the task force headed by Khoury to prepare the strategy. The study has been completed and will be presented to Prime Minister-designate Hariri, before approval by the new government. “The five-year strategy will start once it is approved,” said Khoury, adding that the study focuses on productive sectors that will create more jobs in the country. In agriculture, the study proposes an increase in the productivity of small farmers by providing them with necessary technology for modern farming, according to Khoury. As for industry, he said, the study suggests the creation of four industrial centers that provide necessary infrastructure for factories to compete with regional industrial sectors. Meanwhile, the study aims at increasing the number of tourists from 16 Arab and European countries, by improving tourism services and focusing on medical and environmental tourism. It also aims to turn Lebanon into a regional hub that provide outsourcing services of high quality. 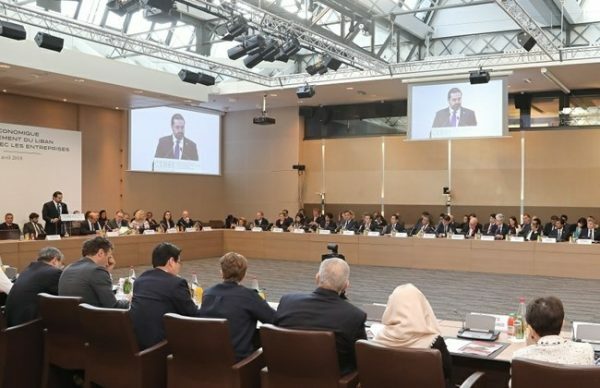 On April 6, France hosted in Paris the international conference in support of Lebanon development and reforms, known as CEDRE. Lebanon secured over 11 billion dollars in soft loans and grants from international donors at CEDRE to revamp its ailing infrastructure and bolster its economy. To qualify for these loans, Lebanon pledged to undertake a series of reforms.